Built in 1964 at the Vulcan Foundry, Newton le Willows, English Electric Type 3 number D6940/37240 was restored to original condition with reinstated buffer beam skirts and headcode blinds in 2010. This was after arriving at Llangollen in 2002 in withdrawn and stripped condition with a rapid overhaul returning her to traffic in 2003. Sadly, we took the difficult decision to sell 6940 at the end of 2018 and she left us for a new life with Boden Rail Engineering Ltd on 15th December 2018. A full overhaul and mainline career beckons! This page has been retained as an archive to allow you to find out all about the locomotive’s life and times at Llangollen (and elsewhere!) 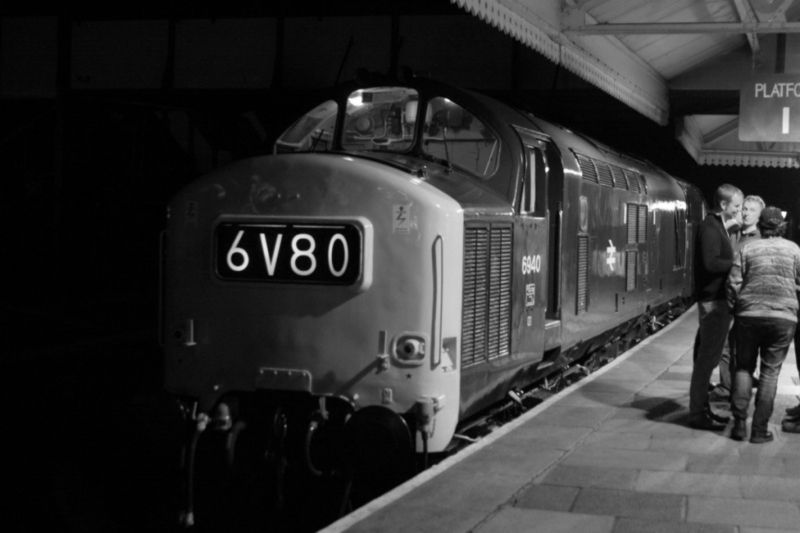 by reading on, with the below information providing all the information that has been covered about the loco on our home page over the last few years. There’s been a lot to write about! Following repairs to the number 2 end bogie, a thorough examination and attention to some faults after 18 months out of traffic, 6940 was successfully started on March 25th. A fault with a sticking Oil Pressure Switch (OPS) contactor on the 37 prevented the loco from running for a sustained period, but this was resolved early on the 28th March running day, allowing the rest of the locomotive and it’s systems to be thoroughly examined. Heroic efforts by Mark Smales, Pete Edwards, Iain Ross and Paul Williams saw a number of issues associated with a lengthy period out of use resolved. 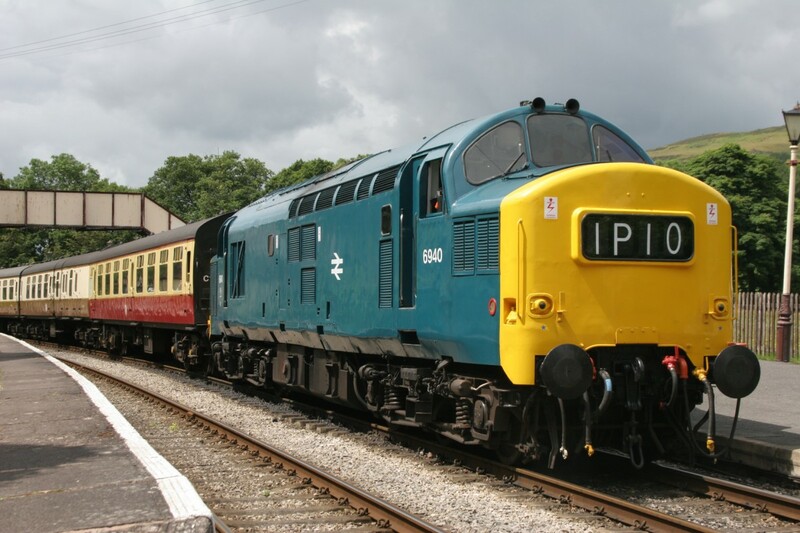 6490 was then able to double-head the last train of the day with D5310, breaking new ground for the class in the process by working back from Corwen. 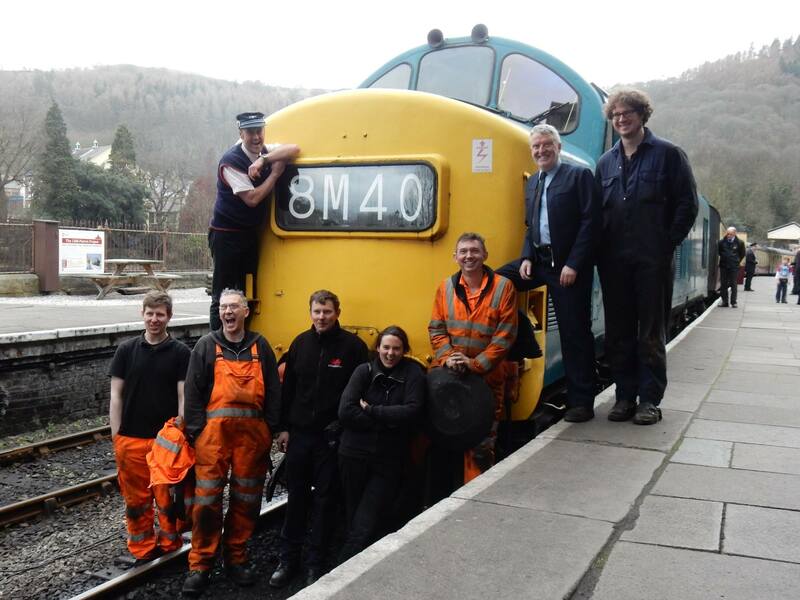 Thanks to Joe Wellsteed for snapping a lot of happy faces with the “Beast of Berwyn” after safe arrival back at Llangollen. 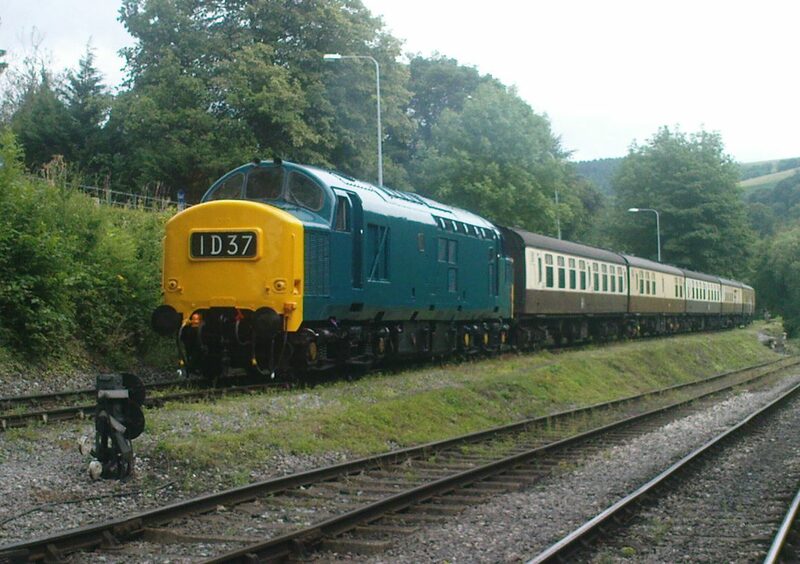 She is also seen below at Carrog, with the Class 104 DMU in the background on a driver experience. 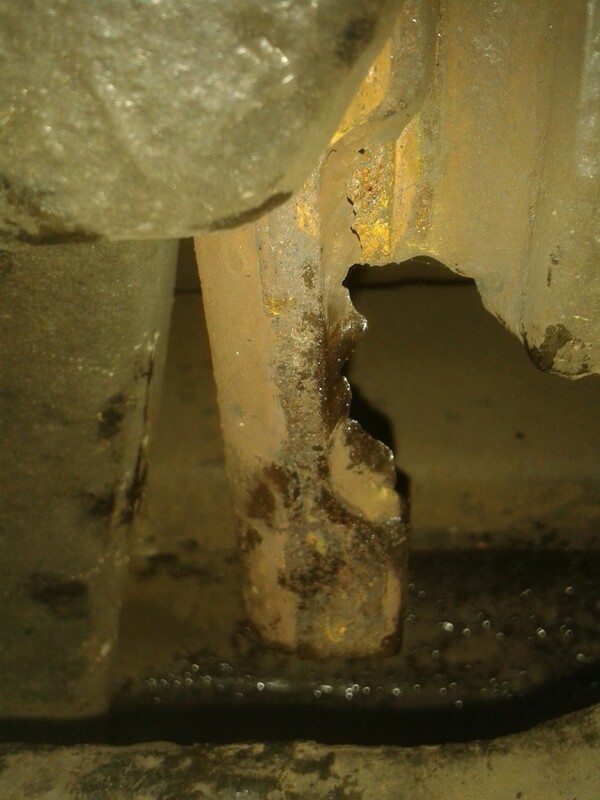 Although successfully de-winterised, started and tested on the 3rd March 2014, 6940 was unfortunately withdrawn from traffic due to finding 5 cracked and one failed manganese liner plates on the number 2 end bogie during routine examination. The failed plate is shown hanging down between the horn guide and bearing side below, thanks to Pete Edwards for the photo. The Group are currently considering the best way to tackle this difficult problem, which will require the loco to be lifted and the bogie stripped to repair. The loco is seen after being started on 3rd March. She first arrived at Llangollen in 2002, travelling by road from the EWS Disposal and Component Recovery Centre based at the former Wigan Springs Branch depot. The loco was withdrawn in 2000 after a fairly typical career for the class based all over the UK working a variety of trains, more details can be found on her history page. 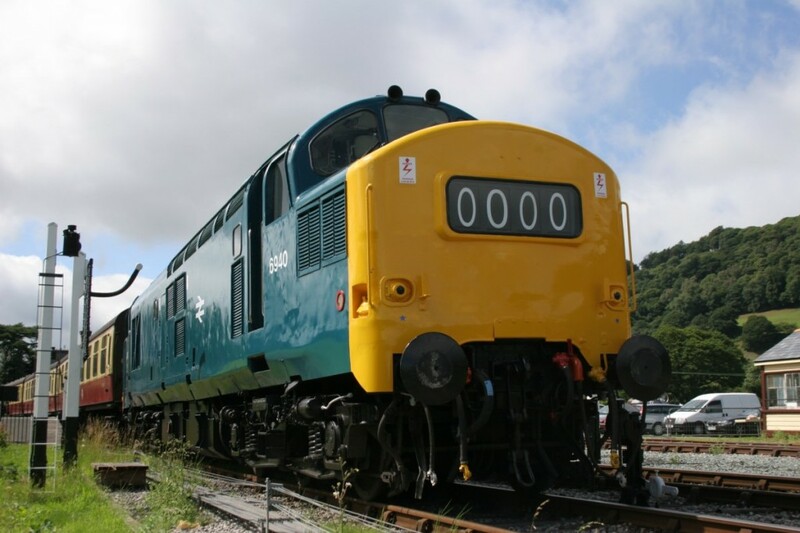 The LDG did not own the loco at this point, but agreed to reactivate the locomotive on behalf of HNRC in return for using her for a couple of seasons whilst Class 20 D8142 was away working on the High Speed 1 project in Southern England. The restoration work required was fairly extensive, including repairs to a power unit crankshaft failure, replacement of a bogie (the original had had its equalising beams burned off to keep the Class 37/4 fleet in traffic following a serious failure of an equalising beam on a loco travelling over the Menai bridge) and extensive rebuilding of both cabs following stripping for spares and vandalism. Nevertheless, excellent progress was made by the restoration team and the locomotive was successfully started in 2003 and returned to service soon afterwards. Returned to traffic in as-withdrawn Dutch Livery, the loco was repainted in these colours and quickly proved a very popular machine with enthusiasts, leading to the LDG making a decision to buy the locomotive from HNRC outright using some of the revenue raised from D8142’s exploits on HS1. 6940 enjoyed reliable and regular operation between 2003 and 2008, with only the odd minor niggle causing one or two failures. However, the loco was out of traffic between September 2008 and July 2010 due to various problems, including sustaining damage to her heat exchanger, radiators and cooling pipes during two winters of repeatedly cold weather. A replacement oil cooler was obtained from a classmate broken up at C.F. Booths Rotherham scrapyard and was fitted to the loco in early July 2009. She then received a long-awaited oil change on Sunday 5th July 2009 and after checking everything was oil and water tight was started for the first time since September 2008. On Saturday 11th July the Dee Valley again echoed to the distinctive growl of an English Electric 12CSVT power unit when ‘240 made a successful test run to Glyndyfrdwy and back. Unfortunately, 240’s return to traffic continued to prove very problematic, with the loco failing after only one trip on the September 2009 diesel running day. Investigations identified a cracked radiator manifold as the source of water loss and the radiators were lifted for repair in December 2009. At this point it was also decided to undertake some bodywork repairs as corrosion was again starting to show through after only 5 years since restoration and the paintwork was already looking decidedly tatty. The livery we wanted to return her to was BR Blue and the decision was also taken to try and reinstate her to as-built condition, which meant we needed to source original round Oleo buffers, refit buffer beam cowls to the front ends and reinstate headcode box windows and blinds. This work was completed in July 2010, just in time for our 1960’s weekend and returned the loco to original 1960’s condition, numbered in a D-less pre-TOPS identity as 6940. This also makes her the only centre headcode box 37 to be currently preserved in original condition. A resplendent D6940 shunting stock at Llangollen on Wednesday 28th July 2010 before application of decals. Photo by Rhys Evans. 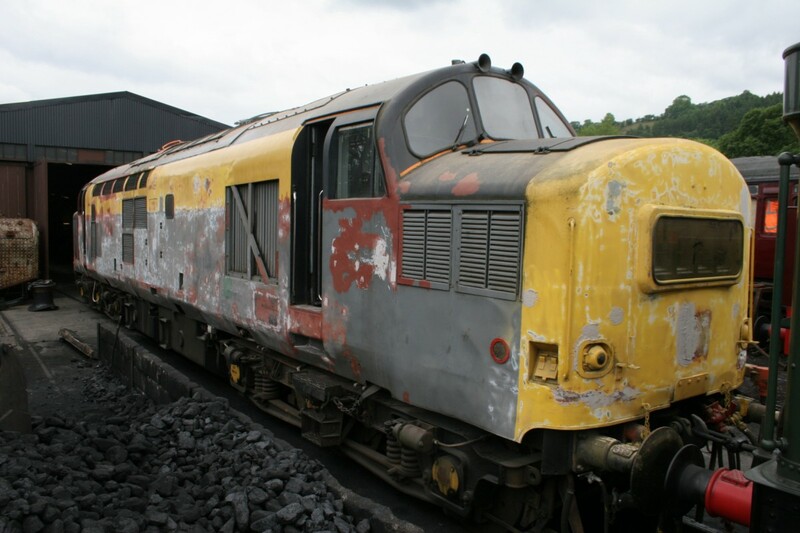 And this is how she looked just a few weeks earlier whilst rubbed down and undergoing bodywork repairs in preparation for repainting. 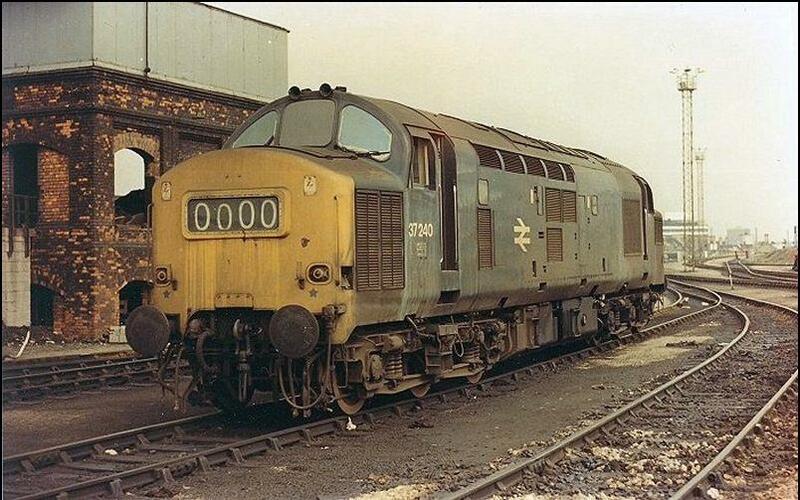 Here’s how she used to look back in the day: 37240 back in the good old days of BR Blue. Full photo details required – please contact me if this is yours! And how she looks now! 6940 at Llan in October 2010. Or could it just be Salop in 1972 with a Margam-bound steel train from Dee Marsh? The loco has had another difficult start to the year after a severe winter, with a damaged heat exchanger being sustained again, unfortunately resulting in oil contamination by water. The situation was most frustrating as the heat exchanger had been drained as fully as possible in accordance with the EE manual. Three burst elements were found when the exchanger was stripped, which were plugged. As the power unit had not been run, the loco was drained of oil, the sump cleaned and then new oil was added with the aim of having the loco running for the March 26th 2011 Diesel Day. Unfortunately, the fresh batch of oil was immediately contaminated due to residual water in the oil system which we had not been able to remove. This time the loco was running and the oil emulsified, contaminating the whole system with a gloopy liquid very similar in appearance, consistency (but sadly not taste) to Baileys. With heavy hearts, the new oil was removed and an extensive clean of the whole fuel system including the lines to the Governor was embraked upon. Flushing oil was used to rinse the system, again being removed before new oil was added. The work took several weeks and was not for the faint hearted – filthy, contorted and frustrating. However the pain was not in vain – the decontamination appears to have been successful, with fresh oil being added to the locomotive on the 19th May. The power unit was run for over an hour, including a successful test run to Glyndyfrdwy and back. All now appears well, with the power unit not appearing to have suffered any damage and no further water contamination. 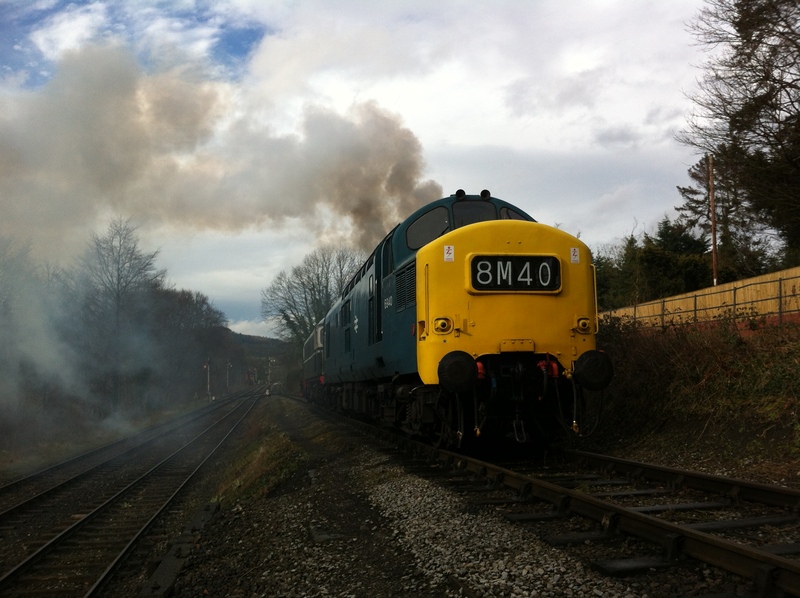 We hope the loco will now be OK for the rest of the 2011 season and for the next winter the heat exchanger will be removed. 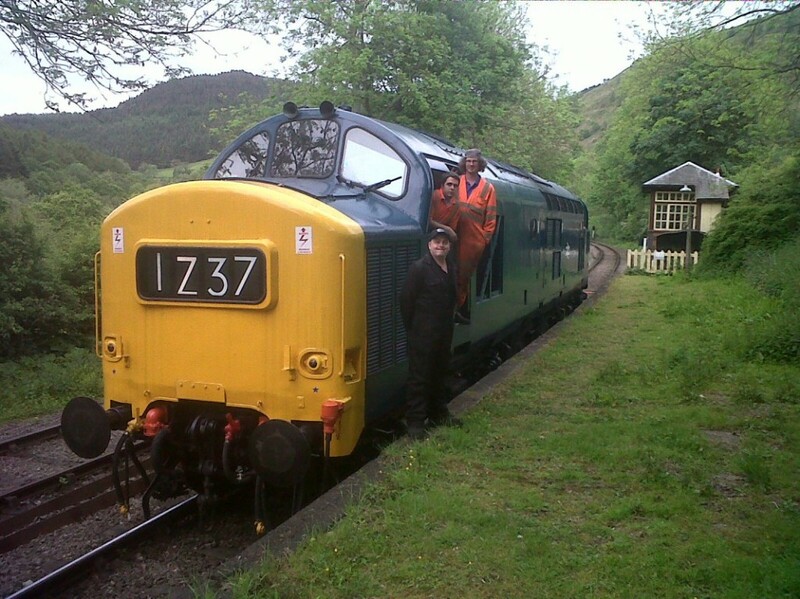 Rhys Evan’s photo below shows Colin, Iain and Bryn with 6940 at Deeside Halt on the locos May 19th test run. 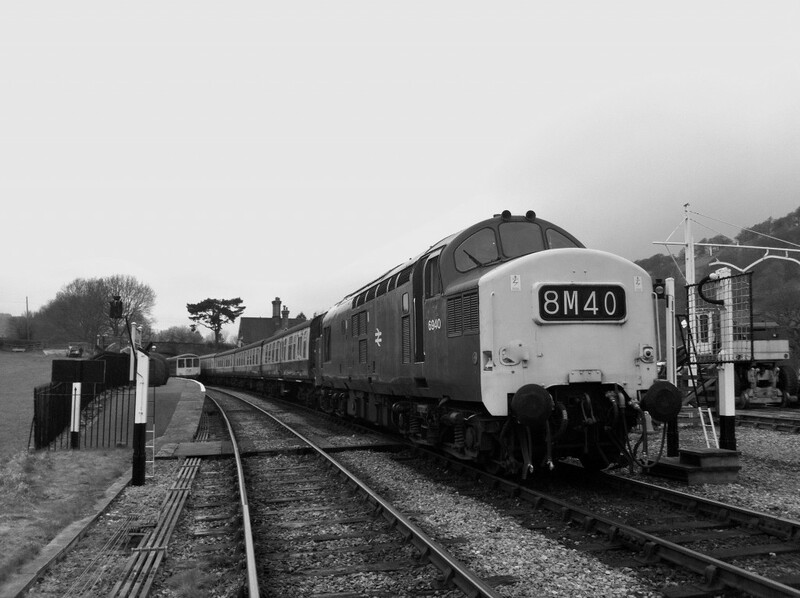 We are pleased to report that 6940 has now completed two full 4 trip running days without incident and appears to be back on form and running well. The Type 3 is seen waiting at Glyndyfrdwy to cross a steam-hauled service on her second 4 trip running day on June 18th.